It is snowing beautiful snowflakes outside and you are cozy and warm inside. You, like another Patch reader, might be wondering why no one is calling this snow cyclone a “Sno-Clone?” Ahem. Sometimes the beautiful weather inspires a walk around the neighborhood, perhaps to grab one extra thing from the store or to pop into a coffee shop for a moment. JP Licks: Closed (only their JP location will be open today). Union Square Donuts: Open til noon. Michael’s Deli: Open at 9:00 a.m. but closed by afternoon. 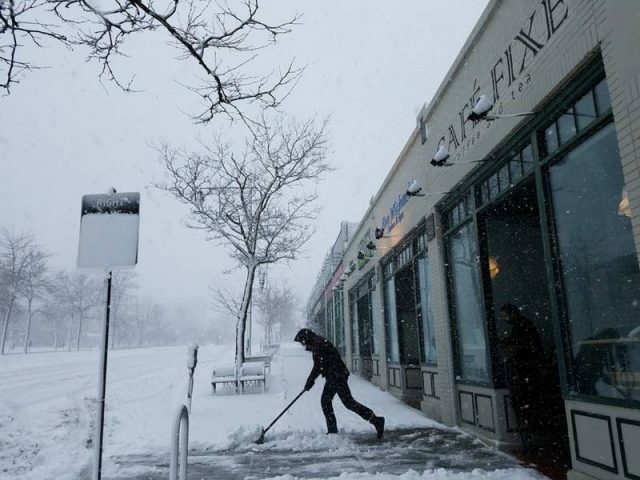 Petes: “They may call us to shut down any minute, but we’ll be open at least another hour,” said the man on the phone at 9:00 a.m.
Curry House: Open until 8:00 p.m.
Cafe Fixe: Open until 4:00 p.m.
Starbucks: Closing at 10:00 a.m.
Barcelona Wine Bar: Open from 4:00 p.m. until “late” with s’mores and other wintery specials. Best Burger Bar: Open for lunch and dinner. Blossom Bar (Where Sichuan Garden is across from Cutty’s): Opens at 5:00 p.m.
Tatte’s on Beacon Street near St. Mary’s: Open 7:00 a.m. to 6:00 p.m. The Shops at Chestnut Hill – Chestnut Hill, MA (closed all day).